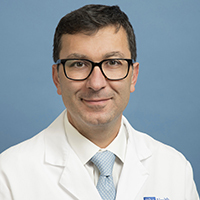 Dr. Chamie is an Associate Professor of Urology at UCLA. He attended Medical School at USC and completed Urological training at UC Davis. Dr. Chamie then completed a SUO certified fellowship in Urologic Oncology at UCLA. His primary research interests are health services research and clinical trials in bladder cancer. His clinical interests include all areas of urologic oncology, with a particular emphasis on bladder cancer and robotic surgery. Dr. Chamie's primary research interests are health services research and clinical trials in bladder cancer. Best Poster, Superficial Bladder Cancer, AUA, Washington, D.C.
2nd Place Best Poster, SUO, Bethesda, MD.